Skip the boxed macaroni and cheese and make this dish for your family instead! My mac and cheese is easy to make and a lot healthier. As some of you know, my cookbook, Natural Pregnancy Cookbook, was recently released. The follow up book, which is due to be released next month, is called Natural Baby Food. I’m really excited about this project because it features over 125 nutritious recipes for babies and toddlers. And the last section in the book includes easy dishes that the whole family can enjoy together. While I was writing the book, I got to test many of the recipes on my own daughter Sienna! If you are interested in joining the group and getting a sneak peak at some of the recipes from the book, head over to the Facebook group HERE. We would love to get more people to participate! vitamins and minerals. Broccoli was the first vegetable that popped into my head but a lot of kids will revolt at the site of those green trees. Cauliflower has similar health benefits as broccoli and it has a mild flavor. And when you roast it in the oven, it gets nicely caramelized and crispy on the edges. that the cheese may have been a little strong for their little ones. If that’s the case, you may want to start with a mild cheddar or even Monterey Jack (or a mixture). Either choice would be a healthier option than using processed cheese. Place the cauliflower florets on a baking sheet lined with parchment paper. Toss the florets with the oil and a pinch of salt and pepper. Roast in the oven until edges are browned and cauliflower is cooked, 15-18 minutes. Meanwhile, bring a large pot of water to a boil and cook the macaroni according to package directions. Drain. Melt the butter in a large saucepan over medium heat. Add the flour and whisk until a smooth paste forms. Cook a minutes until the paste is a light tan. Whisk in the milk. Bring to a simmer, whisking often, until a smooth sauce forms. Whisk in the mustard and ½ teaspoon salt. Simmer the sauce for a few minutes until it is thickened. Remove the pan from the heat and stir in the cheese until fully melted. Add the cooked macaroni and roasted cauliflower to the sauce and stir to combine well. * Note that the nutritional calculations for this recipe use whole milk and full-fat cheese because unless otherwise directed by your doctor, babies and toddlers under 2 should not be eating reduced-fat or fat-free products. They need the fat for proper growth and development. For adults, you can reduce the calories and fat content by substituting reduced-fat milk and cheese. So excited about your next book! As a pediatric RD this will be a wonderful resource for Moms! Thanks Lauren! I can't wait to share it with you! I love the addition of cauliflower for extra nutrition! yum! This is great! 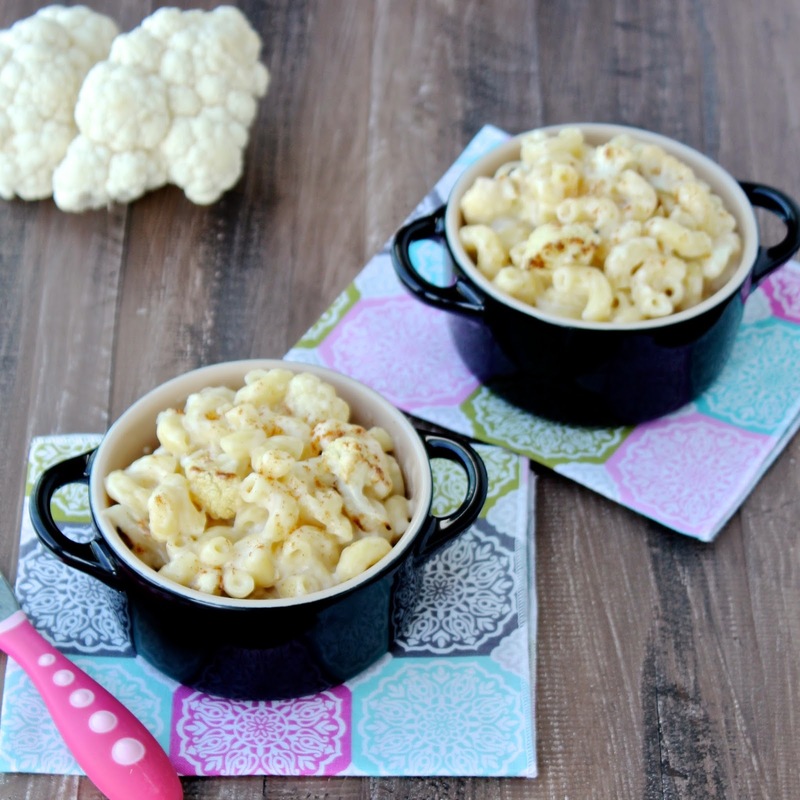 My fiance LOVES mac & cheese, and I would love seeing him eat it with some added nutrients, like cauli! This looks fantastic Sonali! I can't wait to see their feedback! I'm sure it's going to be delicious! This looks delightful! Perfect for a chilly night. Looks delish Sonali! I love that you keep the cauliflower whole, although I find that some kids will shy away from it at the site of the whole vegetable, so I've pureed cauliflower and added it to cheese sauces to get the veggie in. I let the kids know it's in there – I'm not into sneaking veggies into the diet! Congrats on the new cookbook – can't wait to see it! The sharper the cheese the better for my daughters. They would gobble this up. And they adore roasted veggies. Wow – Sonali you re such an inspiration – congrats on your next book – cannot wait to see it! BTW – love the cauliflower in this – delightful! The little girl I nanny would LOVE this! CONGRATS!!! That's awesome! And yes, put him to work- it's never too early!! I just couldn't miss this luscious scrumptious pasta. Love the addition of cauliflower – it smoothes out quite a distinctive cheddar's flavor and i introduces a lovely texture. Well done, Sonali! Happy New Year Ben! Thanks so much for stopping by! So exciting about your book! I can't wait to try these recipes on my picky toddler! This mac & cheese looks divine and I bet tastes amazing! Thanks so much Katie! I hope your toddler loves them. Any feedback is much appreciated! Love how healthy and delicious this mac and cheese is! Congrats on the book, can't wait to get it, even though I don't have kids yet! Wow I've seen Mac n cheese with squashes, but never caulifower! Love the uniqueness Sonali! My husband is never thrilled when I try to get more cauliflower in our meals, but I know with this recipe he will be asking for more!